The Anthony-Northside Neighborhood includes the Layne Crest subdivision, which was created in 1960 by contractor Bob Layne as a single-family residential addition. It is a quiet neighborhood and one of the few neighborhoods surrounding the Ball State University campus that is almost completely owner-occupied. The approximately 10.55 acres along McGalliard Road (referred to as the “Bradburn property”) has been in constant turmoil since the late 1960’s when Bob Layne sought to vacate the plat for commercial development. This action led to a long legal battle that ultimately landed in the Indiana Court of Appeals in 1973 and with a permanent injunction granted against any commercial use of the land of Layne Crest. Numerous attempts since then were made to rezone the property. Each time, the property owners sought to maintain the character of their neighborhood and protect the integrity of the properties. In March 2012 the Board of Zoning Appeals granted a variance request for the Bradburn property and a 216-unit development was eventually built on the site. Located along McGalliard road with access off of Oakwood Dr., the Grove Apartments are marketed towards off-campus college students attending Ball State University. 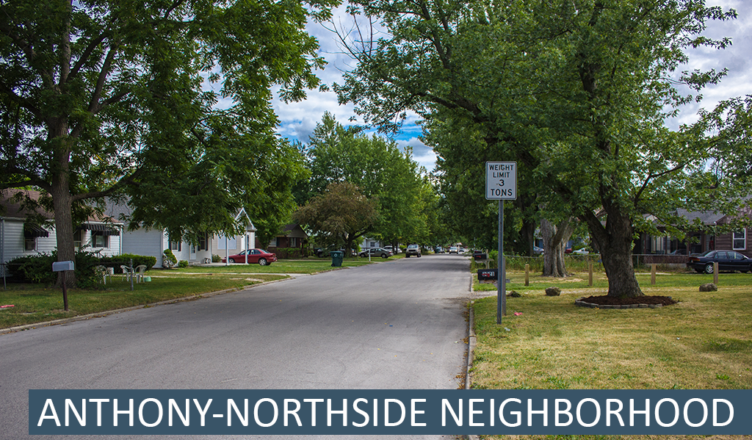 The Anthony-Northside Neighborhood Association meets at Community Fellowship FourSquare Church, 2408 N Oakwood Ave, on the 4th Thursday of odd months at 6:30 pm. November’s meeting date will be the 3rd Thrusday due to Thanksgiving. All are welcome.